Reiki Master Gatherings are held during the year for all Reiki Masters of the Inner Peace Reiki Community. Reiki Master Gatherings are an opportunity for Reiki Masters to come together and share their experiences with their practice, provide support to one another and foster an environment to continue to learn and grow in the work. For many, Reiki Master Gatherings act as a meeting place to nurture and support like-minded friendships; for others, the Gatherings are a chance to refresh their relationship with Reiki in new ways and with different people. Each Gathering will involve a discussion of a topic of choice as well as an exchange. Some topics discussed at Gatherings include; how to present Reiki to clients, sharing how other people use Reiki in their daily lives, each individual’s internal process with Reiki, how each person (the giver or the receiver) feels during a Reiki session, how to explain Reiki to others and a sharing of different Reiki techniques. There are often times guests or presentations on topics of interest as well. 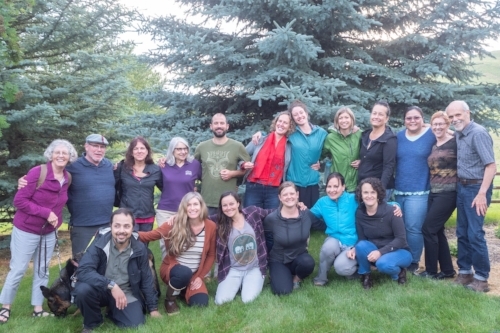 The intention of each Gathering is to continue to cultivate a strong Reiki community in Missoula that supports each persons healing in a rounded mind, body and spiritual way. We hope to see you there! First Reiki Master Gathering of 2018! Cody Dickinson, of Meadowsweet Herbs, gave a wonderful presentation on essential oils. Thanks Red Willow for letting us use your space! This amazing group of beings gathered at Neil and Jeanne's house for a pot luck followed by a beautiful Reiki trade. Thank you to all the Master's that participated!